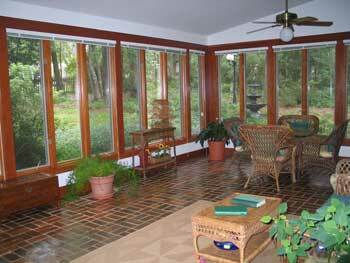 You have several options for sunroom flooring ideas and any of them can make for a very comfortable sunroom or three season porch. Your sun room porch flooring can be both functional and stylish. Mary and I think that choosing an option that best fits your sunroom design, lifestyle, and decorating style is the way to go. Probably the least expensive flooring option, vinyl wears well and is easy to maintain. Installation is relatively easy and is a good DIY project. With such a wide variety of styles, colors, patterns, and textures available you should be able to easily find something that suits your personal preferences. 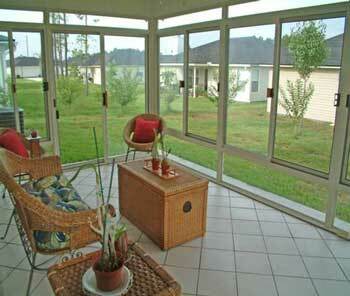 Interlocking tiles are an excellent option for sunrooms. 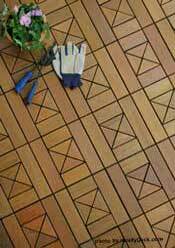 You can install interlocking deck tiles over almost any surface and it is an extremely easy DIY project. You can purchase these tiles in a multitude of patterns, colors, and textures, some of which look like stone. Learn more about interlocking tiles and see our photos depicting the many colors and styles available. (by SunPorch.com) This product appears to be a very good option although I've not used it myself. Like interlocking deck tiles, the Easy-Fit modular tile floor system is designed so that you don't need a subfloor and it mounts on any surface no matter the irregularities. Separate tiles have raised 5/8" on a series of legs made from polypropylene. This allows for drainage and very quick drying. They snap together and can be cut to fit with a utility knife making installation easy. They come in a variety of finishes to include ceramic, carpet, or wood. An accessory feature with SunPorch.com's sun rooms, they are surely worth checking out. 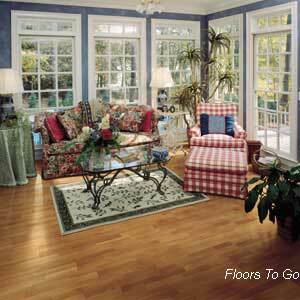 Wood is my favorite flooring material and works well as sunroom flooring. (I admit my bias because I'm also a woodworker and admire the beauty and fine qualities of wood). Many prefer lighter tones like pine for sun rooms but I believe any color will work depending on the effect you want to achieve. However, please note that ultra-violet rays will fade the color of wood over time. You can also soften the look of wood by using indoor outdoor area rugs shown below. Wood laminates are another option. I've used both and can attest that good laminate wood flooring is well worth the investment. Laminates are easy to install and maintain. Whether you choose hard wood or wood laminates, you'll be surprised by the many options available in our wood flooring section! Who doesn't like the feel of carpet under foot! For a real warm look and undoubtedly warm to your toes, you can't beat carpet. We recommend a high quality weather and mildew resistant carpet which is available at most carpet stores. 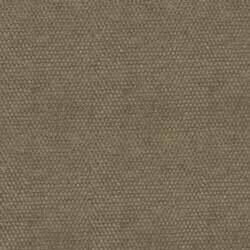 Usually sold by the linear foot, outdoor carpet is stabilized to protect it from fading and many are made from Olefin fiber which is very durable. 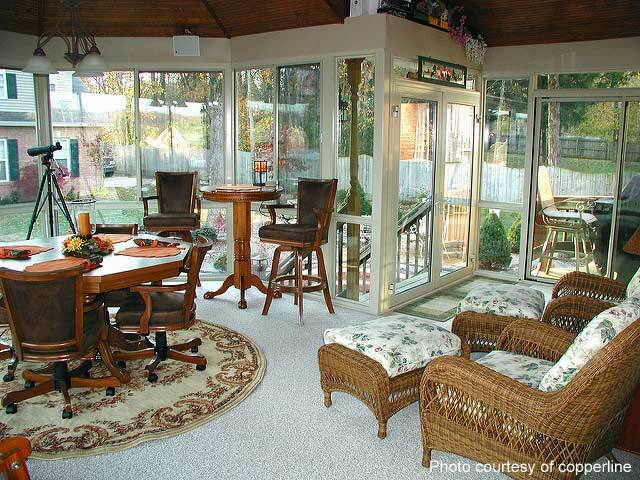 Outdoor carpet tiles are another good option for sunroom flooring. They are easy to install (usually peel and stick) and in the event they become stained or damaged, simply remove the affected tiles and quickly replace them. 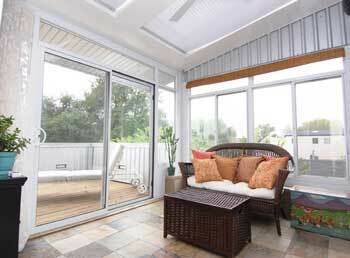 Another advantage is you can mix and match different colors or styles to create a unique look in your sunroom. 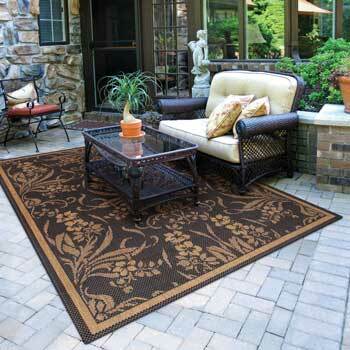 Indoor or outdoor rugs: indoor outdoor area rugs, like the one in the photo below, are perfect for sun rooms. They come in a very wide variety of styles, patterns, sizes, and materials so it is so easy to find just the right ones for your sunroom. Use them to define specific areas for dining, conversation, or just relaxing. See our outdoor rug photo gallery from which you can select your ideal indoor or outdoor area rugs for your sun room. 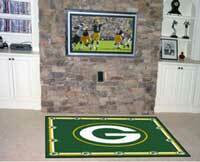 Sports Rugs An adaptation of indoor outdoor rugs, support your favorite team with an outdoor sports rug or two. You can find a sports rug like the one at right for almost every team - sure to be a hit with the sports enthusiast in your home. Add sports memorabilia and you'll have a novel idea for decorating a sun room. 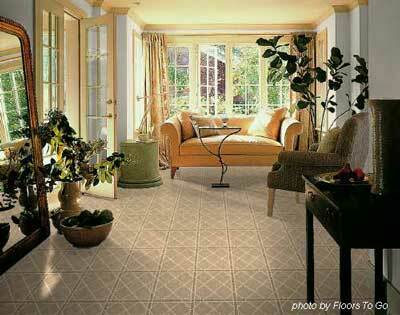 All are long lasting and beautiful options as sunroom flooring. Maintenance is very minimal. Although more expensive than other options and will usually require professional installation, you'll have options like mosaics and more dramatic patterns. These are the most durable of all the options and are fantastic for high traffic areas. 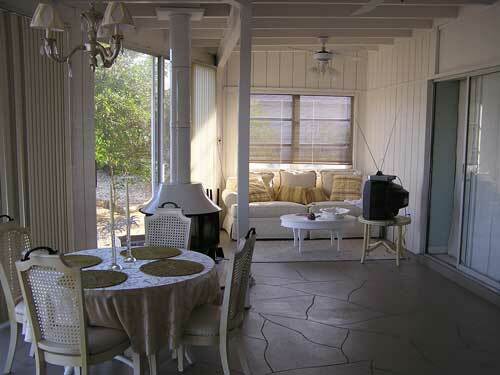 Don't discount concrete for your sunroom flooring. With the right paint, stains, or stamping and you can create a relatively inexpensive beautiful floor like the one in the photo below. Be sure to see our concrete flooring section; you'll be amazed at what you can do with concrete!